“How ya doin’?” barrel-chested Dennis asked, rounding my desk at my public works job. He grabbed my jar of chocolates and took one. “Good! Tonight’s going to be a long one, so I hope you had some downtime today.” He unwrapped a candy. “Wha’d ya do?” he asked. “Some backcountry skiing,” I replied. I didn’t clarify the differences. Whether on cross-country or backcountry skis, I enjoy the beauty and quietness of simply being out there—but there are other aspects even more compelling, which rouse more primal, visceral and satisfying feelings within me. Sitting at my desk, I thought of the past weekend, when Mike and I went to Lassen Volcanic National Park, with its jagged peaks amid ancient volcanic remnants. At the Kohm Yah-mah-nee Visitor Center, we found the snow still firm. Our destination, Mt. 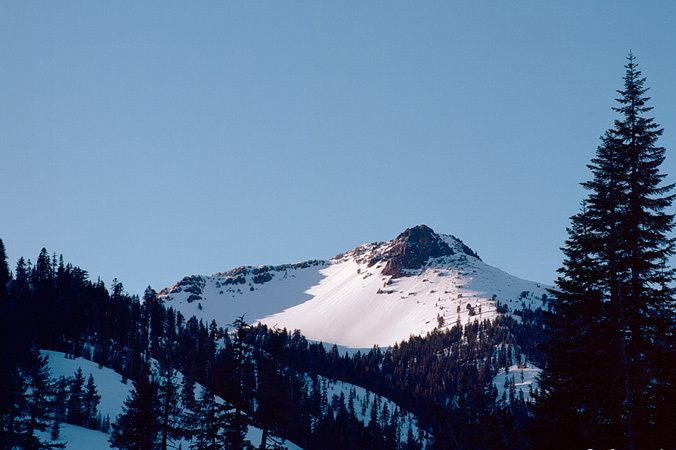 Diller, at 9,000 feet, features the Sunbowl, a steep, south-facing amphitheater topped by a short chute. As we kickturned away from the trailhead, it felt good to get into a rhythm; we climbed, chatting about straight-lining the chute. Halfway up, the day closed in with light snow. We watched the snow deepen to five inches as we reached tree line beneath the bowl. Mike wanted to zigzag up the amphitheater and then traverse the ridge westward for more vertical. I wanted to climb straight to the high point. So we decided to race to the rendezvous point west of the chute, via our own paths. I climbed swiftly, veering only to circumvent a three-story promontory. When I stopped to don my goggles and helmet, my knees leaning into the slope, I waved at Mike moving up the eastern side. He raised a ski pole. The snowfall intensified as the steepness increased. I climbed on, my breathing growing heavier with the elevation. I could see Mike and wanted to beat him to the rendezvous. As we neared our crux, I realized that the crest was an insurmountable, powdery arc over rocks. The turbulence below the arc created a visible dervish of snow, and I turned and saw Mike’s blurred silhouette making motions to go down. Strong gusts rocked me, so I returned a similar sign. One of Mike’s skins flapped wildly in the wind. I stabbed my skis into the slope, and they began oscillating when I released my hold. Mike began making tentative turns as flurries obscured him from view. I struggled with my bindings. Then something snapped, and my boot and ski came apart. I fell to my knees and snatched the ski off the slope. Holding it close to my face, I saw that a piece was missing. I pressed my boot into the binding anyway, looking down toward Mike, seeing his gray silhouette flipping his skis downhill. My first turns were cautious. I didn’t want to test the toepiece or the sluffing snow beneath my edges. “You OK?” I yelled when I neared the bottom. He replied with a thumbs up. With snow howling, we took cover in the well of a large spruce. “We shouldn’t stay here long.” Mike said, and I nodded. We ate in silence then took inventory. Through calmer snow swirls we could see deep, light powder everywhere. The snow felt like clouds beneath our skis. We spun 360s between the trees, skiing fearlessly to the truck. Later, in my office, I gripped my chair’s armrest. A meeting over the next several hours would provide its own challenges and satisfactions. But all I wanted was to be back on that slope, head down, kicking steps through the howling wind, amid the rhythmic retreat of the mountains.